Every good structure starts with a good frame. Mammals have a skeletal structure to provide support and protection to their bodies. Every home and building must start with a solid, sturdy frame to guarantee that it is structurally sound. And the same can be said of hot rods. A car must start with a sturdy frame in order to be safe and reliable. A chassis is the framework of an artificial object. It supports the object during both construction and while the object is in use. For example, the chassis of an electronic is the internal structure where the circuit boards and electronics are mounted. Firearms also have chassis. In long guns such as rifles, it is the frame that has replaced the traditional wooden stock making the gun more accurate. Even with these different applications, chassis are probably best known for their use in motorized vehicles. The frame of a vehicle is also known as a chassis. A vehicle’s chassis is the frame in which everything is supported including the suspension, drivetrain, brakes and body. Though it is an incredibly important part of a vehicle not very many people know much about it. The chassis is the most important part of the construction of any vehicle. It is what all parts are attached to and it provides structural integrity which prevents the vehicle from falling in on itself. Without a solid chassis then a vehicle would not be structurally sound. Car chassis were originally modeled after those of stagecoaches and were made from wooden frames. But, in 1900, steel and aluminum sheets allowed designers to create different shapes. During this time the most common type of construction used was composite construction. Composite construction is when the chassis and the body are built as two separate parts. First, the chassis is built with its components and then the body is assembled and attached to the chassis with hardware. These mounts are more flexible and allow the body of the vehicle to slightly move while in motion and help in the production of the vehicles. This allows the rolling chassis to be completely built and then simply attach a different body style on the top. Today, trucks, buses, and larger cars still use this form of construction. By the 1960’s, most cars switched to a unibody or monocoque construction. This created a one-piece structure which is the overall shape of the car and its chassis structure. Unibody frames are made by welding several pieces of sheet metal together, the largest piece is the floor plan and then other pieces are added to it to create the shape of the vehicle. The monocoque form of construction originated with aircrafts in the 1920’s. The first car made using this form of construction was created in 1922 and was called the Lancia Lambda. Though unibody construction was becoming more popular it wasn’t mass produced until 1951. Compared to composite construction monocoque construction usually has a heavier gauge metal in the floor pan area. In the upper body it will be heavier in the rear seat, bulkhead and floor assembly areas to provide better strength. Unibody is cheaper to mass produce, more space efficient and has good crash protection. Today, this is the main form of construction for all small to midsize vehicles in large part because of the additional safety it provides. Going and buying a completed hot rod doesn’t really give you much of a say in the type of chassis that you get. Afterall, it’s up to the builder of the vehicle to make those determinations. But what if you want to build not just a car, but a hot rod, from the ground up? First, you want to find a company that can supply you with everything you need for this awesome undertaking. Hells Gate Hot Rods has the parts that you need. First thing you want to start with is the chassis, since of course this is what everything else is going to attach to. 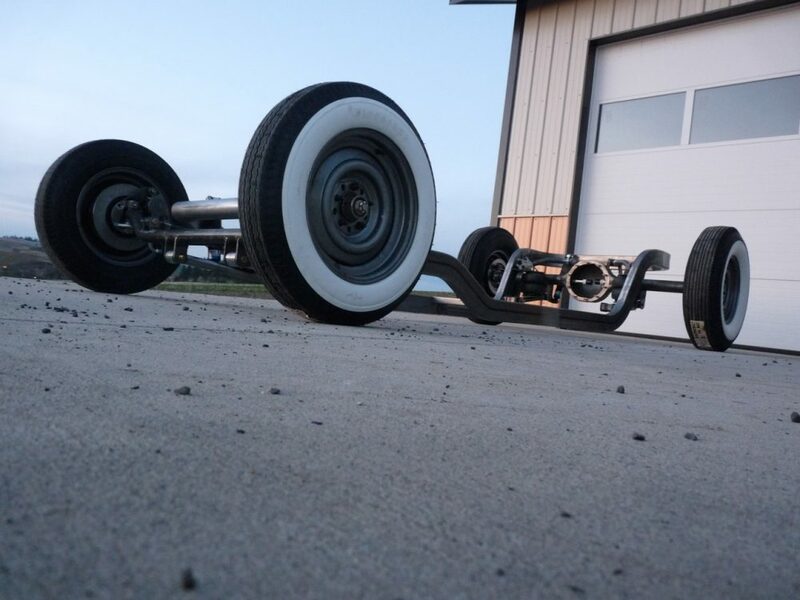 The Air Ride Chassis is a full air bagged, mandrel bent chassis for your Ford Model A hot rod. It doesn’t compromise geometry, ride quality or suspension. Simply put, this chassis is “Hot Rod Simplicity with Adjustable Ride Height”. Standard chassis includes: front disc brakes, rear disk brakes, front and rear airbags and front and rear shocks. You can also choose to include a steering box, wheels/tires, body mounts and engine/transmission mounts. This chassis is the be all end all of chassis and is perfect for anyone wanting to build their own hot rod. We want to help keep hot rodding alive so contact us today for more information or to place an order.